45% of work activities can be automated including those performed by highest-paid occupations | What's The Big Data? …fewer than 5 percent of occupations can be entirely automated using current technology. However, about 60 percent of occupations could have 30 percent or more of their constituent activities automated. In other words, automation is likely to change the vast majority of occupations—at least to some degree—which will necessitate significant job redefinition and a transformation of business processes. Mortgage-loan officers, for instance, will spend much less time inspecting and processing rote paperwork and more time reviewing exceptions, which will allow them to process more loans and spend more time advising clients. Similarly, in a world where the diagnosis of many health issues could be effectively automated, an emergency room could combine triage and diagnosis and leave doctors to focus on the most acute or unusual cases while improving accuracy for the most common issues. Our work to date suggests that a significant percentage of the activities performed by even those in the highest-paid occupations (for example, financial planners, physicians, and senior executives) can be automated by adapting current technology.7 For example, we estimate that activities consuming more than 20 percent of a CEO’s working time could be automated using current technologies. These include analyzing reports and data to inform operational decisions, preparing staff assignments, and reviewing status reports. 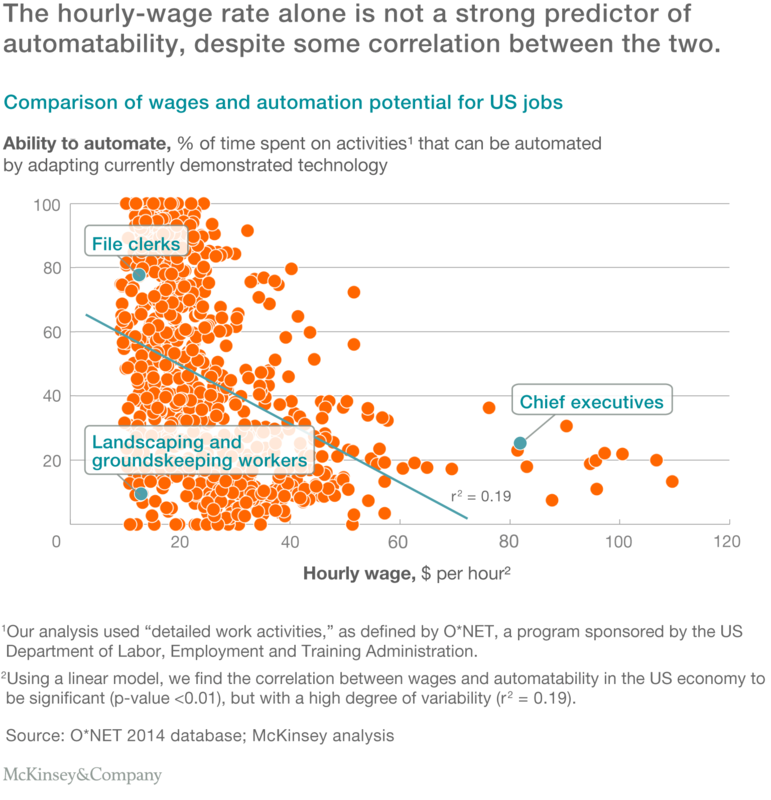 Conversely, there are many lower-wage occupations such as home health aides, landscapers, and maintenance workers, where only a very small percentage of activities could be automated with technology available today [see chart above]. This entry was posted in AI, Automation and tagged labor automation, McKinsey, MGI. Bookmark the permalink.